You see, Shih Tzu have many unique characteristics that are simply not common with other dogs. For example, their flat faces make them susceptible to certain health risks and because they have hair (not fur), they need regular grooming, much more than most dogs. They also have a reputation for being a little “stubborn” and aggressive at times. And these problems can get more and more out-of-control if you don’t get a handle on them right away. Shih Tzu are also the absolute most loving and friendly dogs you can imagine. And fortunately, there are many things you can do to raise a perfectly happy, healthy and well-mannered Shih Tzu puppy who will be your perfect companion for years to come. Hi, my name is Bev and these days most people know me as the “Shih Tzu Gal.” It all started a couple of years ago when me and my husband were having lunch at a local Deli and we came across a woman who had the most beautiful little dog I had ever seen. This little dog was a Shih Tzu and she was the most happy, cuddly “furbaby” you could imagine. Soon this dog (“Mindy”) and her owner were on their merry way, but I couldn’t get the thought of our encounter out of my head. In fact, if it’s your first time here…. ShihTzuWeb.com — what started as a tiny little website — has since been featured all across the country in places like Yahoo!, the Boston Globe, PetNet, and Animal Radio. Because usually what you find are outdated books and “cut and paste” websites that just type in “Shih Tzu” when they could be talking about any other breed. 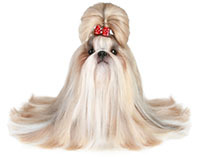 At ShihTzuWeb.com we know that Shih Tzu ARE different and pride ourselves on delivering to you the best and most update-to-date information for Shih Tzu owners. And wouldn’t it be great if there was an easy, step-by-step guide that shows you how to do all this and more? Professional Dog Whisperer Asia has been helping Shih Tzu owners — And their canine counterparts — live happy, healthy, and stress-free lives together for over 40 years. Well my friend, that’s the reason why I’m writing this today… Because finally, for the first time ever there is. I sat down with one of my Shih Tzu gal friends, Asia, who has over 40 years of experience working with Shih Tzu as a trainer, dog whisperer, and groomer. She even has an amazing 8-year old Shih Tzu of her own, named Boris. All the most common challenges they faced… . A best-selling guide that’s become known as The Ultimate guide for Shih Tzu Puppy Owners. Ultimate Shih Tzu Puppy Guide: Everything You Need To Know To Raise A Happy, Healthy, And Well-Mannered Shih Tzu Puppy! This book has answers to practically EVERY question you could possibly have about caring for your Shih Tzu puppy. Keeping your puppy perfectly well-groomed is easy when you know the secrets in the Ultimate Shih Tzu Puppy Guide. Discover how to groom your Shih Tzu puppy like a pro. The Ultimate Shih Tzu Puppy Guide shows you exactly how to train a well-mannered Shih Tzu puppy who is a joy to be around. And that’s just a taste of everything you’ll discover in our Ultimate Shih Tzu Puppy Guide! I promise that we’ve left no stone unturned here. ALL your questions will be answered! What Is The Investment For This Amazing Guide Going To Be? So very conservatively, you’ll save at least $200 in training, grooming and vet fees if you get your copy of the Ultimate Shih Tzu Puppy Guide right now. But my goal is to spread joy to the world by having as many people as possible have happy relationships with their pets. Because of that, I want to get this guide into as many Shih Tzu puppy owners’ hands as I can. So your investment today for the Ultimate Shih Tzu Puppy Guide is not going to be $200, $100, or even $50. That’s right, for just ONE payment of $27 you can get the Ultimate Shih Tzu Puppy Guide – Digital Only Version. This is a digital ebook that will be sent to you by email. You’ll be able to download the 208-page Ultimate Shih Tzu Puppy Guide - plus all of the amazing bonuses I’m about to describe – minutes from this very moment. However, I will tell you that this special offer will not be around forever. Because right now I’ve set aside 97 copies of the book… and once they sell out (which could happen at any moment), I’ll have to raise the price back up to $47. So take advantage of this special deal now while it’s still available! As you can imagine, keeping a website running and coming up with new free articles and videos takes time and resources. And the proceeds from sales of this book allow me to keep the website up and running so I can continue offering helpful information to Shih Tzu owners around the world. All this and more can be yours if you just follow our step-by-step Ultimate Shih Tzu Puppy Guide. Iron-Clad, Have A Perfect Shih Tzu In 6 Months Or Less Money Back Guarantee! Go through the entire guide and see for yourself how effective the information is. If after a full 6 months you honestly don’t feel like its helped you have the perfect Shih Tzu, just let us and know and we’ll issue you a prompt and courteous refund. No questions asked. Believe me. The LAST thing we want is an unhappy reader. These Cheat Sheets sell separately on our website for $19.95. But when you order your copy of the Ultimate Shih Tzu Puppy Guide now, they’re yours FREE. This special bonus lays out exactly what you need to do for the first 4-weeks of training your Shih Tzu puppy. This schedule is perfect if you are training your Shih Tzu puppy for the first time and want to know exactly what to do each and every day. Just follow this simple schedule and you’ll have a well-mannered dog in no time! This Training Schedule sells regularly for $14.95. 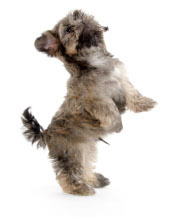 Once you get a handle on the basic training techniques found in the Ultimate Shih Tzu Puppy Guide and have gone through the 4-week Training Schedule, you’ll want to show your friends some advanced tricks. This special guide shows you step-by-step how to teach your Shih Tzu many tricks including shaking hands, rolling over, “speaking”, the human hoop jump and more! A $19.95 value. You get our 246-page Ultimate Shih Tzu Puppy Guide, which contains detailed information on everything you need to know to raise a happy, healthy and well-mannered Shih Tzu puppy. The book, written by Shih Tzu experts who truly love Shih Tzu, has up-to-date chapters on keeping your puppy healthy, proper care and feeding, fixing problem behavior, grooming, training, housebreaking, and MUCH more. Your investment for the book today is only $47 $27. So don’t delay, order right now so you don’t miss out on this special deal. Because the truth is, the cost of not taking advantage of this special offer is huge. You’ll still have a ton of questions, and those peddlers of Shih Tzu misinformation will just be waiting to take advantage of you. You’ll still have a Shih Tzu puppy that’s not as perfect as you know it could be, whether it’s currently acting up, has health problems you can’t figure out how to solve, or is not looking well-groomed at the moment. I don’t want this for you, and I don’t think you want it either. You have everything you need to be the perfect mommy (or daddy) for your Shih Tzu puppy. If you can follow the instruction in our simple, step-by-step guide I promise that the way you feel about your puppy, and the way it feels about you, will be absolutely amazing. If you like it, then keep it… If not, no problem… just let me know and you’ll receive a fast and courteous refund.